I’m not bad at soldering, I just find it boring to solder multiple links in a chain! I like the metal clay elements in this necklace. They are carved into solid pieces of clay and I love carving so they were great to make. I used ceramic paint to add colour after firing as well as liver of sulphur. I had higher hopes for this necklace but here are the scores. 7 out of 10, just scraped through. “It’s a design that has been used a lot.” I’m assuming they mean the combination of chain and elements, erm, isn’t that what the project asks for? Make a necklace of metal clay elements joined with constructed sterling chain. 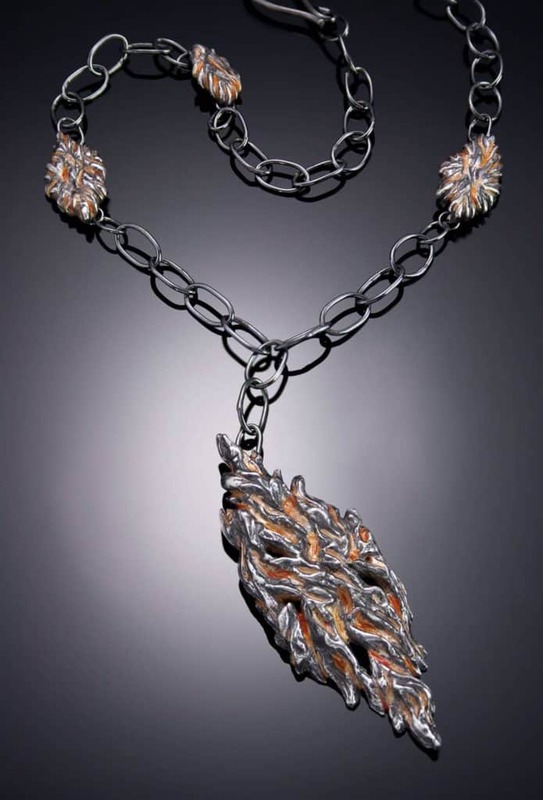 The purpose of this project is to demonstrate the ability to fabricate a chain in sterling silver using conventional techniques and to integrate that with panels, plaques, beads or other components made of metal clay. This should be a wearable necklace at least 16 inches long.